Despite all the odds happening in family front for the past two months, it looked like almost impossible to bake a cake for the anniversary of my blog. But somehow I managed to bake yesterday, and it turned out so good that those cake slices brought back smiles on our faces. That is what it does every time, Cake means happiness and baking work so well as a stress buster. I love tea time cakes. Simple cakes with lots of flavours make me happier than a slice of frosted cake. 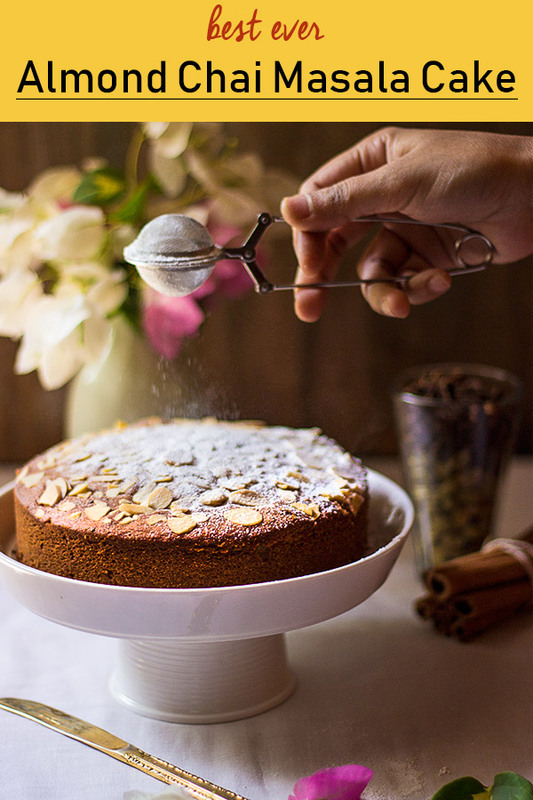 This recipe was bookmarked months ago, I’m glad that I finally tried and got totally awestruck by the airy crumbs of this Almond Chai Masala Cake. It’s not a pound cake as described in the original recipe, a pound cake is more firm and dense in texture. However, I loved this cake for many reasons, it’s easy to make, the ingredients are very handy and above all, I love chai spices and the smell they offer, can’t describe in words how wonderful my home was smelling when I was baking this cake. I tweaked the recipe from its original version a bit, I didn’t like to use vanilla extract because I wanted our Desi Chai flavour intact in this cake, and that assumption worked pretty well. Watch the Chai Masala Powder recipe video below to make your own chai spice blend and use that to bake this cake. 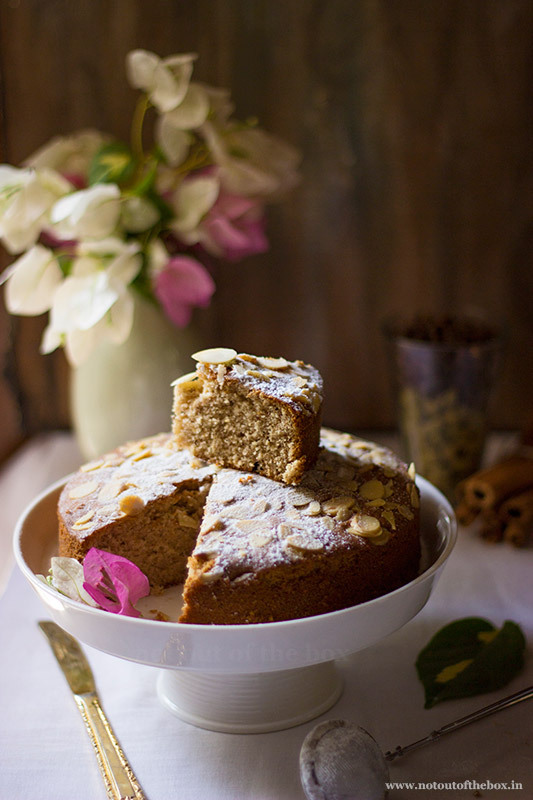 Almond Chai Masala Cake is an easy to make tea time cake. Airy crumbs, soft texture and flavourful, this cake is extremely addictive. Preheat oven to 176 degrees C. Prepare a 6” round cake pan or loaf pan by greasing with oil and place a piece of baking paper at the bottom of the pan. In a bowl, mix all the dry ingredients except sugar (flour, baking powder, salt, baking soda, and chai spices). In another bowl, cream butter and sugar using your electronic hand mixer or stand mixer whatever you have. In this add the egg and keep whisking. Next to add honey and yogurt, whisk well. Now add the flour mixture into this in two batches, whisk the batter until smooth. The batter would be thick and that is completely fine. Pour the cake batter into the cake pan. Smooth the top with the help of a spatula. Tap cake pan gently on kitchen counter couple of times to release the air bubbles. Sprinkle some almond slivers on top. Bake for 30 minutes. Insert a sharp knife in the middle of the cake. The cake is ready if the knife comes out clean. If not, bake for some more time, and then check again. Cool the cake in the pan for 15 minutes and then run a sharp knife around the edges of the pan and carefully remove the cake. Turn onto a cooling rack and leave there until cool completely. If you’re making Chai masala from the recipe video use 1 tbsp of it for making this cake. During baking time cover the top of the cake pan loosely with a piece of aluminium foil after first 20 minutes, to avoid over browning of the Almond Slivers. Keep the cake slices refrigerated, as it’s summer now. Consume within a week. 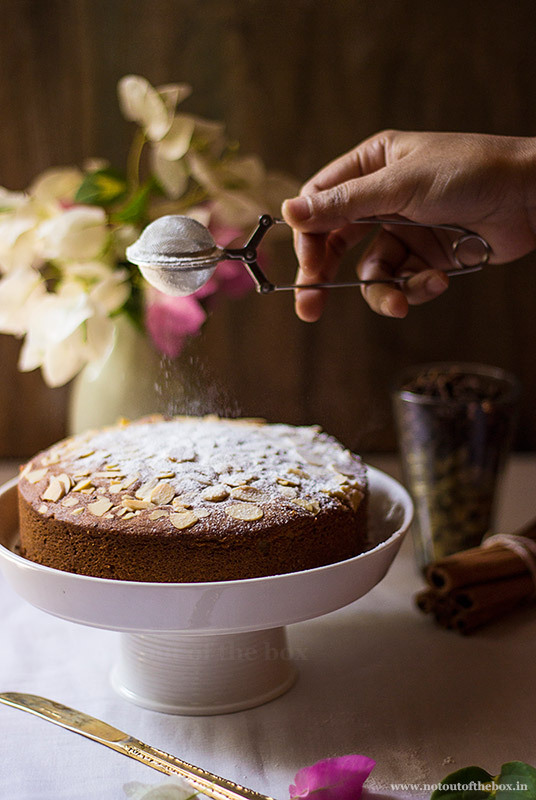 Hey dear thank you so much for the yummy almond cake recipe. I need one help when ever I make cake with baking powder and baking soda. It’s never give me good out come like the knife test come clear but cake is always but kind of uncooked. Thanks a lot for your help. Will try it soon. Hi is there any substitute for egg in this recipe? Hi Payal, no substitute for this one.